SUMMER IS HERE AND THE HYDROS ARE COMING! The U-9 Les Schwab Tires with Andrew Tate aboard is scheduled to test in Tri-Cities on June 1. SEATTLE, May 29, 2018–As summer approaches and the days get longer, H1 Unlimited hydroplanes are warming up to match the weather. 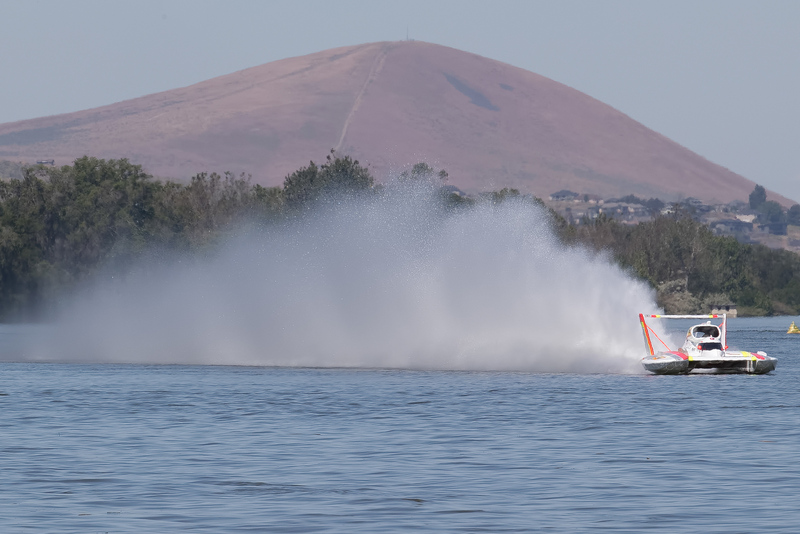 Four H1 Unlimited hydroplane teams will be in Kennewick, Washington, on Friday, June 1 to test their equipment in preparation for the upcoming season. With the first race scheduled on Guntersville Lake, Alabama, on June 22-24, this is an important final step to get ready for the summer. The daylong event at Columbia Park is hosted for the 11th year by the Tri-City Water Follies organization and is free to the public. The teams confirmed to attend include: U-1 Miss HomeStreet, driven by Jimmy Shane of Maple Valley, Wash.; U-9 Les Schwab Tires, driven by Andrew Tate of Walled Lake, Mich.; the U-11 Reliable Diamond Tools presents J&D’s, driven by Tom Thompson of Cambridge, Md. ; and U-440 Bucket List Racing, driven by Dustin Echols of Sultan, Wash. Narrowly missing the national championship by 324 points, Tate and the Les Schwab Tires team hope they can gain valuable data from the test that will give them the advantage going into the inaugural Southern Cup at the end of June. Tate said the team looks forward to the 2018 season and once again contending for the H1 Unlimited national championship. “The boat has continuously improved and I am growing more comfortable with finding the hull’s limits. The Tri-Cities test session gives us the ability to prove the Campbell brothers (Jeff and Mike) off-season hull innovations,” he said. In the off-season, the Reliable Diamond Tools presents J&D’s team, which last attended a preseason test in 2012, made numerous changes to its race boat and engine program. The team is preparing to test the various changes made after the team placed a strong fourth in the last race of 2017 at San Diego. Thompson, the team’s driver, said he is excited to test the changes made during the off-season. “Scott (Raney, owner/crew chief) and the crew have been working long hours on changes to the U-11 this winter. This test session will allow us to be more prepared for the season opener in Alabama. ”Thompson said he always looks forward driving on the fast Columbia River and said the test session will be a great way to start the season. Tri-City Water Follies event director Kathy Powell said they have also extended invitations to the Hydroplane and Raceboat Museum’s vintage unlimited hydroplanes, as well as the smaller classes of hydroplanes. Several food trucks from the area will be at the Neil F. Lampson pits to complement the day’s activities. Live streaming of the testing event will be available on the Internet by local TV affiliate SWX Right Now (KNDU-TV) with Matt Funk and Kay Brewer covering the day’s action. The streaming can be found at www.swxrightnow.com and on the station’s mobile device application ‘Watch SWX,’ which is available at the app stores. H1 Unlimited hydroplanes are the fastest racing boats in the world and their races are sanctioned by the American Power Boat Association, doing business as H1 Unlimited. With deep history, the 115 year-old sport‘s majority of hydroplanes are powered by turbine engines that produce 3,000 horsepower, allowing the H1 Unlimited hydroplanes to reach speeds of nearly 200 mph, producing a massive 60-foot tall, 300-foot long wall of water called a roostertail behind them. With very few restrictions, these majestic hydroplanes race in front of shorelines packed with fans on bodies of water throughout the United States. For additional information on the 2018 H1 Unlimited Hydroplane Racing Series, visit the series website at www.H1Unlimited.com or visit on social media on Facebook’s ‘H1Unlimited and Twitter ‘H1Hydroplanes’.